For nearly a decade I have been writing daily devotionals. It all started with a challenge I made to my congregation to join me in reading through the Bible. I decided to encourage them by sending a daily email with the Bible passages for the day, and a short encouraging word that was drawn from one of the texts for the day. Since that time the daily emails led to a blog version. This past year I decided to start editing the devotionals for a 365 devotional book–one for every day of the year (all keyed to the same daily Bible reading plan). Well, the edit is finished and I have published my e-book for Kindle. It is available exclusively on Amazon for now. Stay tuned for further developments. 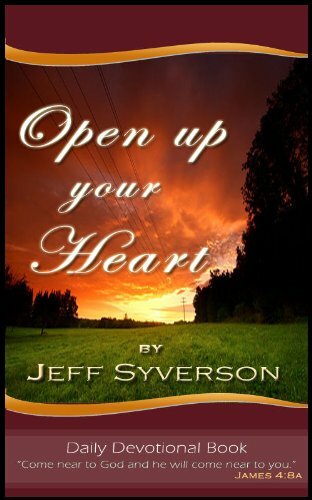 Maybe you don’t have a “kindle” e-reader but you would like to read my new devotional book, “Open Up Your Heart.” Did you know that you can read the book on your computer or tablet or phone? There are free Kindle apps for many different platforms. Download one of the apps, and then you can buy and read the book. I have been reading His devotionals for about 6 months. They are so well written and inspiring. I would highly recommend this book to everyone. It really has a great amount of reading per day but not too much and his devotionals are inspiring. It’s one of the best devotionals I have done in my lifetime. It’s a must buy book!